Hey Bruce, I'm not sure whose Firebird this might be. Can you fill me in? Jon, this appears to be one of the Titus cars, either the car Milt Minter drove, or their 'mule' back up car. It would be very early in the season as they would be hoping to still run the 303 Pontiac engine, but it wasn't yet homologated as 1000 units had not been 'sold'. There were cars using the '69 Firebird front in testing but I have not seen any race pics of the cars using this front until Craig Fisher ran the Todco entry in the '70 T/A season. The wheels don't look like the Minilite but more like the American Racing that was common prior to '69. There is more information coming out all the time on these cars, so the book is still open. 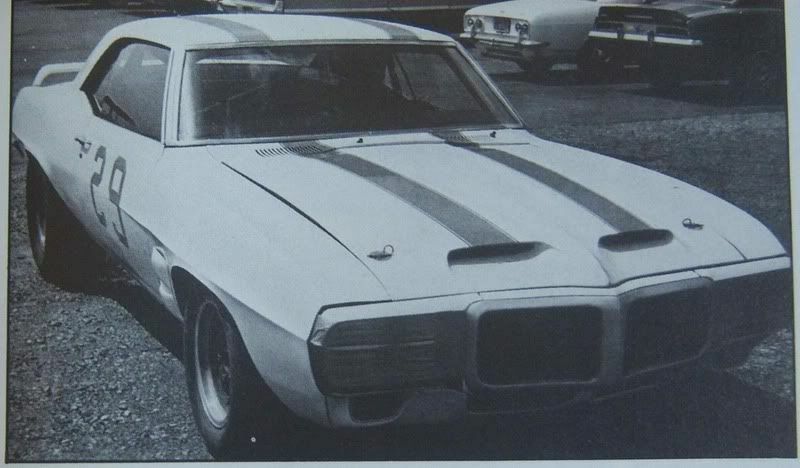 Bruce, the first race of the '69 season Milt Minter had a T/G Firebird with the '68 style grille and also it had a different paint scheme than the usual white with blue stripes. As you say, I don't think a Firebird raced with the '69 grille until the Craig Fisher car in the 1970 season. This car above, since it had a number on the side, threw me for a little loop since it seems like it may be "race ready" but I don't recall seeing any photos of it on the track. That profile shot of the Firebird looks very much like the one used in an article next to a stock Trans Am, and Jerry between the two. Definitely a first iteration of the race car. Though it looks a bit high in the front it could be minus engine. Mike, Thank you very much for posting the pics of the T/G car and bus (ex mobile Post office) for sale. I must try and find a copy of that CP & A. 2 TRANS-AM FIREBIRDS with 302 Chevrolet engines built by Jerry Titus for the 1969 season complete with spare engines and fueling apparatus. Contact Mike Wallace Hol-Arc Ltd. of Dallas, Tex 75209 (214) 357-4694 N.
Mike, thanks for posting the text from that ad. I can't speak for Bruce but I know I hadn't seen it before. My collection of CP&As from 1970-1972 is not as complete as for the earlier years. Here is a picture sent to me from Vic Laskorski. Based on the aluminum front spoiler, it appears to be from an early test session for the '70 season. As such, it would seem to be the car that Craig Fisher drove that year. I'm not sure if this is at the end of the pits at Laguna Seca or somewhere else. Jon, Isn't that one of the pics from the japanese article by Kanji Satoh ? It was written around some tire testing session. There is a very similarly prepared car in the T/G shop with the white fender scoops and taped on headlight covers. 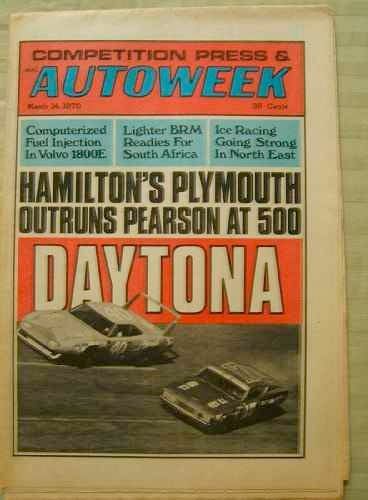 My impression is that it was very early in the season, hence the '69 Pontiac front. The photo was sent without any background information on it so I took my best guess, failing miserably. Funny thing is, when I first started typing I wrote that it appeared to be from a very early test session but I went back and looked at the picture and the aluminum spoiler caught my eye. It is fairly similar to what Craig Fisher's car had at Laguna Seca in 1970. Hence, I went back and changed what I wrote and did a "crash and burn" from there. Thanks guys for keeping me in line. 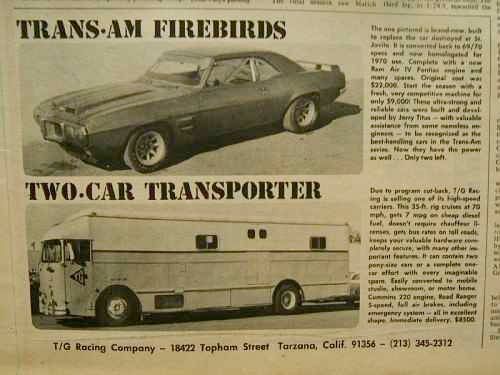 Here is a shot from the "Finelines" article that focused on racing Firebirds. This looks to be very early in the build sequence, the initial cars together, and possibly they were still aiming to run the 303, insufficient 303 engines sold to the public meant it was not homologated, and they again ran the Chevrolet 302 and the '68 Firebird front though with '69 fenders with the full length swage line above the front wheel opening. Great photo and information, Bruce, Thanks for posting! So what track do you figure they were testing at in the photo I posted? It looks a lot like Stardust raceway in Vegas, but it's been quite some time since I was last there. This was also around the time Paul Lamar was doing some work on the first gen Firebirds. There is a pic of him with the cars and a very high wing on it.